Jill Price has the first diagnosed case of a memory condition called "hyperthymestic syndrome" -- the continuous, automatic, autobiographical recall of every day of her life since she was fourteen. Give her any date from that year on, and she can almost instantly tell you what day of the week it was, what she did on that day, and any major world event or cultural happening that took place, as long as she heard about it that day. Her memories are like scenes from home movies, constantly playing in her head, backward and forward, through the years; not only does she make no effort to call her memories to mind, she cannot stop them. 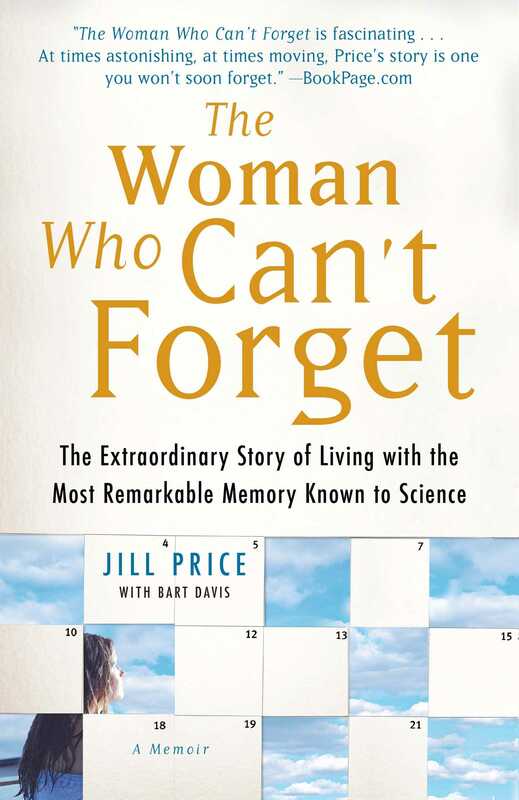 The Woman Who Can't Forget is the beautifully written and moving story of Jill's quest to come to terms with her extraordinary memory, living with a condition that no one understood, including her, until the scientific team who studied her finally charted the extraordinary terrain of her abilities. Her fascinating journey speaks volumes about the delicate dance of remembering and forgetting in all of our lives and the many mysteries about how our memories shape us. As we learn of Jill's struggles first to realize how unusual her memory is and then to contend, as she grows up, with the unique challenges of not being able to forget -- remembering both the good times and the bad, the joyous and the devastating, in such vivid and insistent detail -- the way her memory works is contrasted to a wealth of discoveries about the workings of normal human memory and normal human forgetting. Intriguing light is shed on the vital role of what's called "motivated forgetting"; as well as theories about childhood amnesia, the loss of memory for the first two to three years of our lives; the emotional content of memories; and the way in which autobiographical memories are normally crafted into an ever-evolving and empowering life story. Would we want to remember so much more of our lives if we could? Which memories do our minds privilege over others? Do we truly relive the times we remember most vividly, feeling the emotions that coursed through us then? Why do we forget so much, and in what ways do the workings of memory tailor the reality of what's actually happened to us in our lives? In The Woman Who Can't Forget, Jill Price welcomes us into her remarkable life and takes us on a mind-opening voyage into what life would be like if we didn't forget -- a voyage after which no reader will think of the magical role of memory in our lives in the same way again. Jill Price is the subject of the most exhaustive scientific inquiry into superior memory in history. She has kept her identity anonymous until now, known by the scientific community as patient "AJ," the first patient to ever be diagnosed with what the scientists who have studied her have called hyperthymestic syndrome. She lives in Los Angeles and is currently working as an administrator at an elementary school.